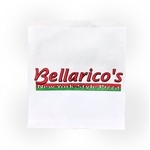 We are the restaurant supply leader in the United States and carry the best quality pizza bags to keep them warm. Our best brands of Bags include Bellarico and BVT Chef Revival. Handgards Pizza Bag - 8.5 in. x 12 in. Update International Standard Pizza Delivery Bag - 20 in. x 20 in. We have been selling Pizza Bags for 40 years. We know how to take care of your restaurant supply needs and strive for perfect service.